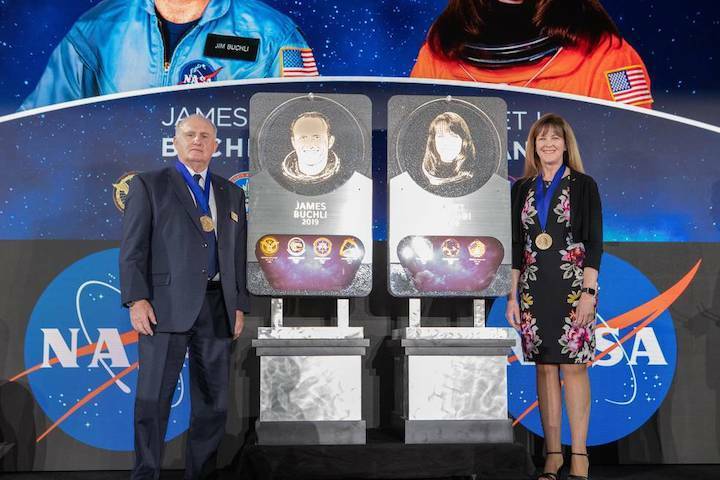 Former NASA astronauts Jim Buchli and Janet Kavandi are inducted into the U.S. Astronaut Hall of Fame Class of 2019 during a ceremony on April 6, 2019, inside the Space Shuttle Atlantis attraction at NASA’s Kennedy Space Center Visitor Complex in Florida. They unveiled their plaques, which will be placed in the Hall of Fame at the visitor complex. 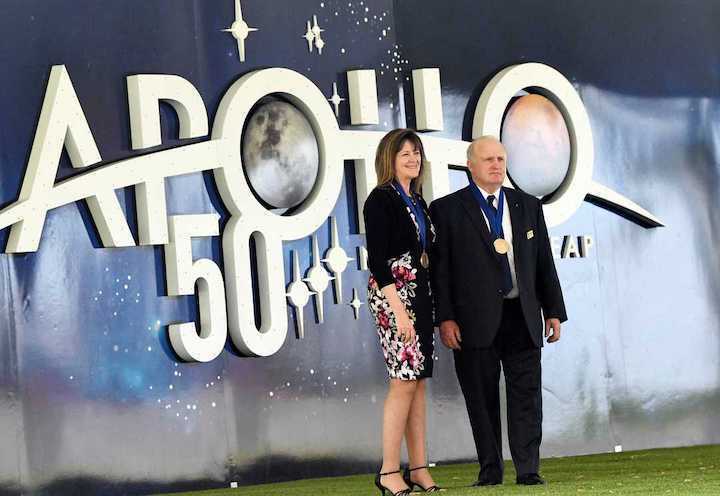 US Astronaut Hall of Fame inductees James F. Buchli and Janet L. Kavandi stand for pictures Saturday at Kennedy Space Center Visitor Complex. CAPE CANAVERAL — Both were from small towns in middle America destined for great things. 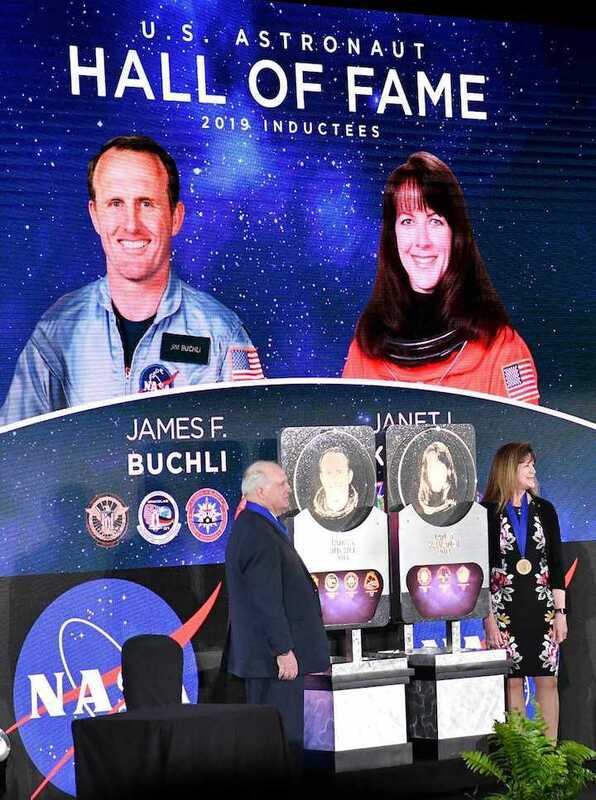 US Astronaut Hall of Fame inductees James F. Buchli and Janet L. Kavandi are introduced to the crowd during ceremonies Saturday at Kennedy Space Center Visitor Complex. Janet Kavandi remembers looking up at the night sky from rural Missouri where the Milky Way would be on full display. James Buchli came home from a 13-month tour of Vietnam to a below-freezing North Dakota winter. Together, they would uproot and go on to fly more than a combined 20 million miles in orbit, circling the earth hundreds of time each. Buchli flew four shuttle missions between 1985 and 1991. Kavandi flew three between 1998 and 2001. The two longtime Space Shuttle astronauts were inducted into the U.S. Astronaut Hall of Fame on Saturday as part of the 18th class of space explorers to be recognized. Only 99 astronauts ever have been inducted. Kavandi, a scientist with several advanced degrees, might give off an air of quiet academia — at least that’s what fellow astronaut Steve Lindsey thought upon meeting her. 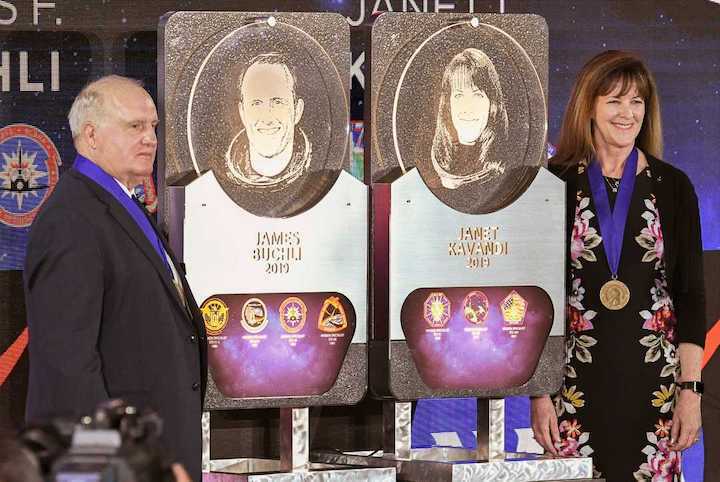 US Astronaut Hall of Fame inductees James F. Buchli and Janet L. Kavandi stand with their likenesses during ceremonies Saturday at Kennedy Space Center Visitor Complex. That was until they were on the shuttle where the crew was charged with testing out a new space-age toilet. “Suddenly, something long and brown comes floating toward us” from under the curtain outside the toilet, Lindsey recalled. He looked on with horror and disgust until he saw Kavandi in the corner holding a camcorder and laughing. US Astronaut Hall of Fame inductee Janet L. Kavandi addresses the crowd during ceremonies Saturday at Kennedy Space Center Visitor Complex. 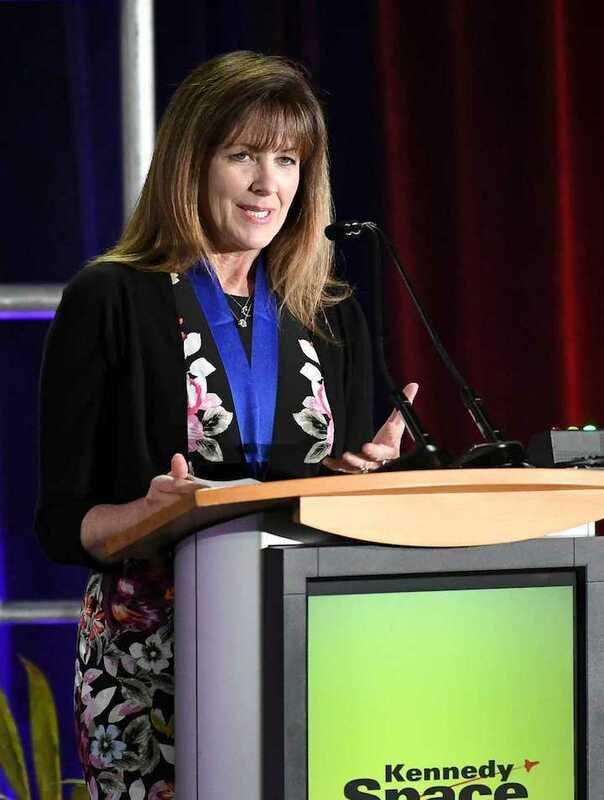 A room full of the country's brightest and bravest astronauts cracked up at the anecdote, but for Kavandi, practical jokes came second to the science of space travel. Among her proudest contributions are the topography recordings she did, some of which are still used in navigation apps today. On a larger scale, she was also involved in the launch of a device called the Alpha Magnetic Spectrometer. "It's up there collecting cosmic particles from the beginning of time" searching for antimatter in space, Kavandi said. "That's one of the most fundamental experiments we have in space to help answer some of the deepest questions about the origins of the universe." 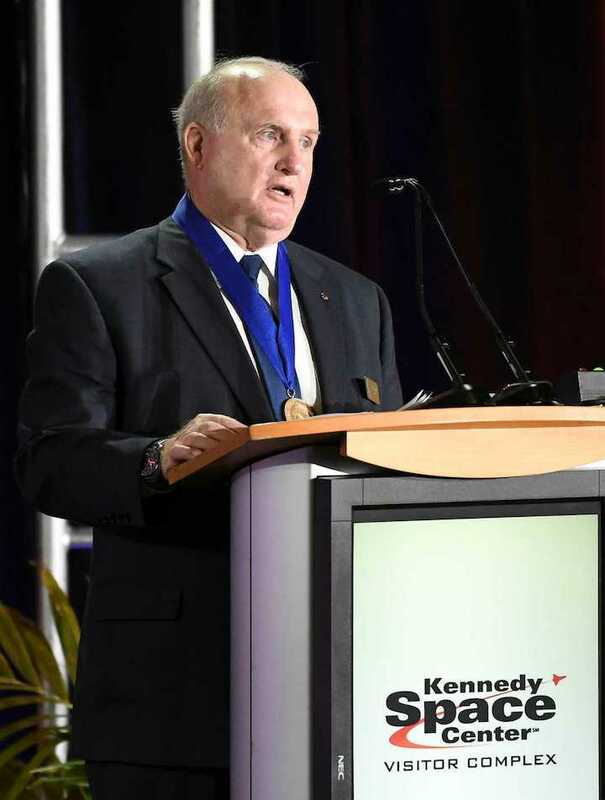 James F. Buchli talks about his time as an astronaut during his induction into the US Astronaut Hall of Fame during ceremonies Saturday at Kennedy Space Center Visitor Complex. For Buchli, it was as much about the mission as about the science. Both astronauts -- a scientist and a soldier -- arrived in the shuttle program by different trajectories but both credited their families as a huge part of their success. Buchli recalled talking to his wife when NASA was seeking the first class of astronauts for the shuttle program and how they made the decision together not to pass up the once-in-a-lifetime opportunity. Kavandi recalled how losing her own parents early in life made her appreciate her family and her colleagues in the space program all the more. "These people are my family, too. We treat each other as family. We tease each other but we're also there for each other no matter what," Kavandi said. "In any trying time, your family will always be there for you."